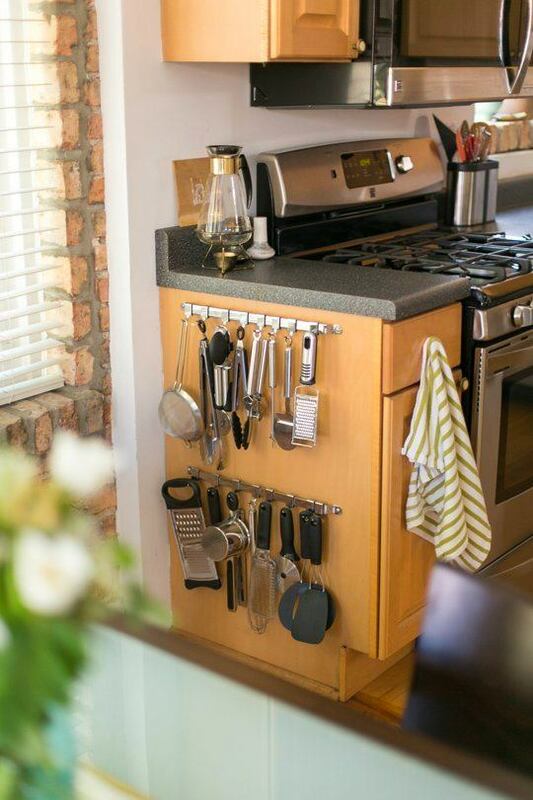 Do you believe that your kitchen is so small that keeping all the cooking essentials in it is just impossible? And are you sure that you make the most of the potential of your space? 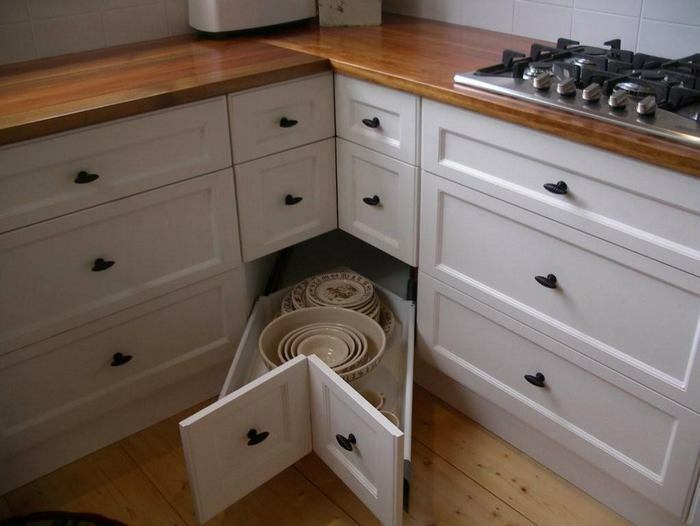 We’ll give you 25 ideas of creating extra storage areas and believe that you’ll find many of them useful for your kitchen! 1. Hang a magnetic or cork board on the inside of your cabinet door. Here you can keep recipes and small stuff. 2. 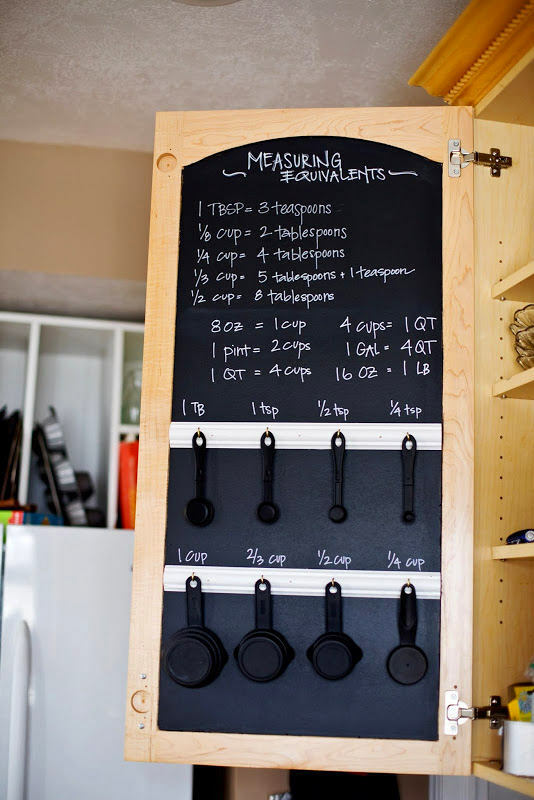 If you dream about having a chalkboard in your tiny kitchen, you may save space by hanging it inside the cabinet too. 3. 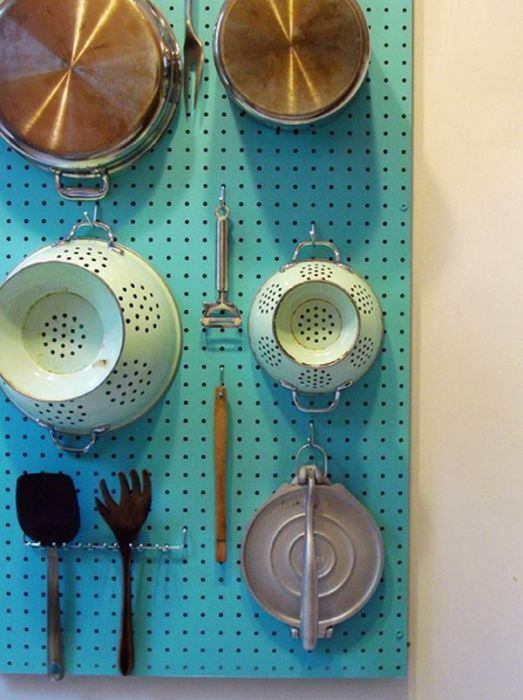 Make your walls work: hang pots and pans on a perforated wall board. 4. 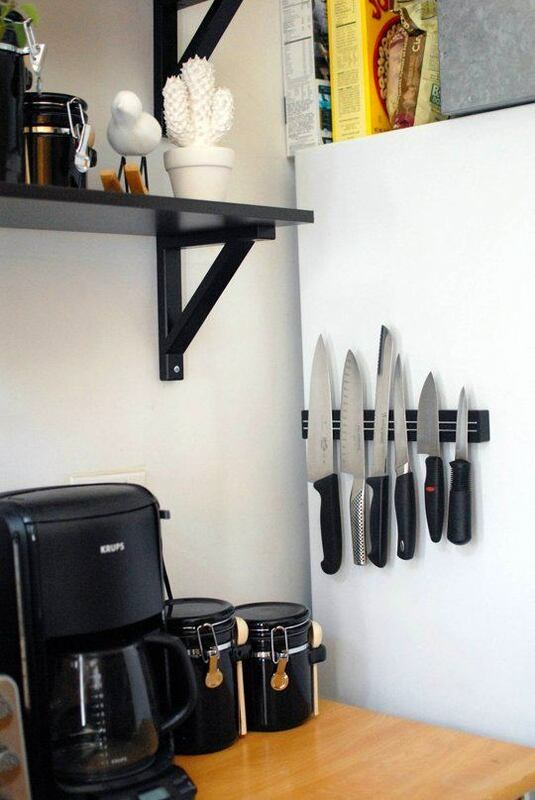 Use magnetic holders for keeping your knives – it’s more convenient and space-saving. Besides you can keep such a holder both vertically and horizontally and on any surface. 5. 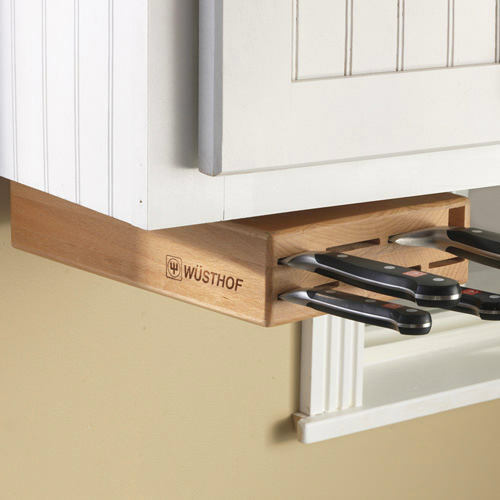 One more convenient option for keeping knives is a wooden “scabbard” mounted to the bottom of a top cabinet. 6. 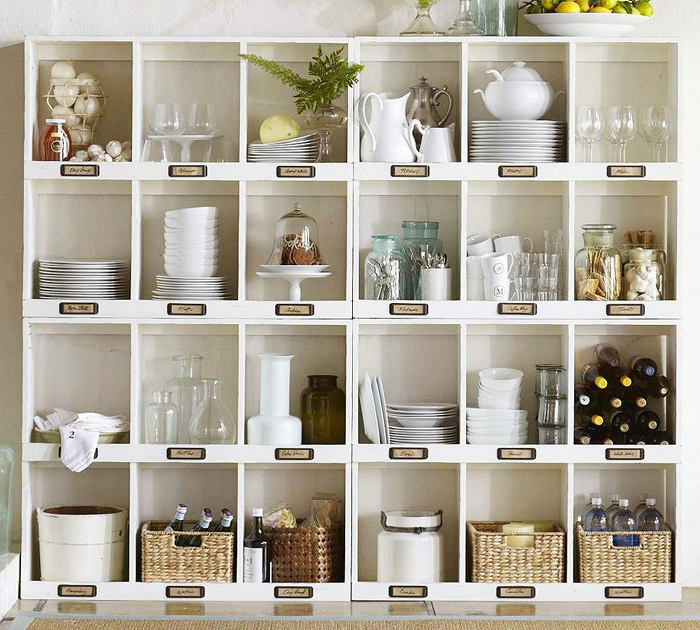 Don’t hesitate to keep everything that didn’t fit into cabinets on open shelves. 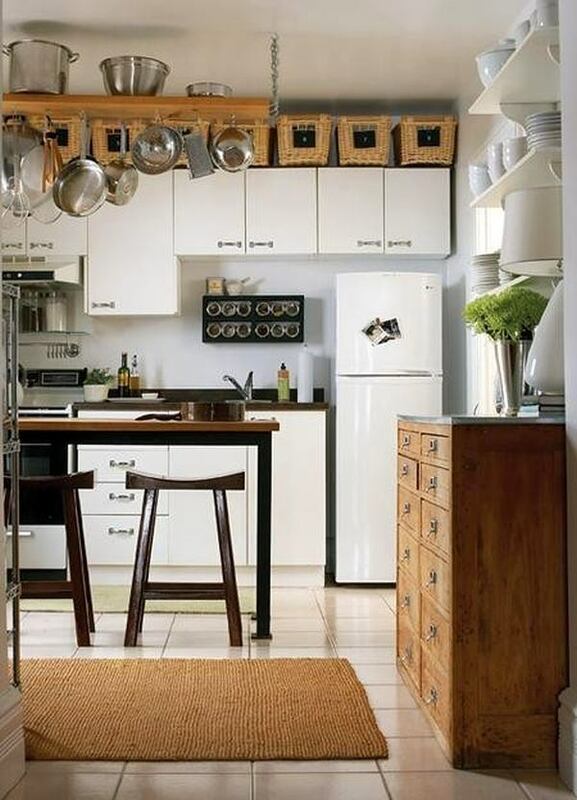 Such a storage area can be designed very aesthetically and neatly. 7. 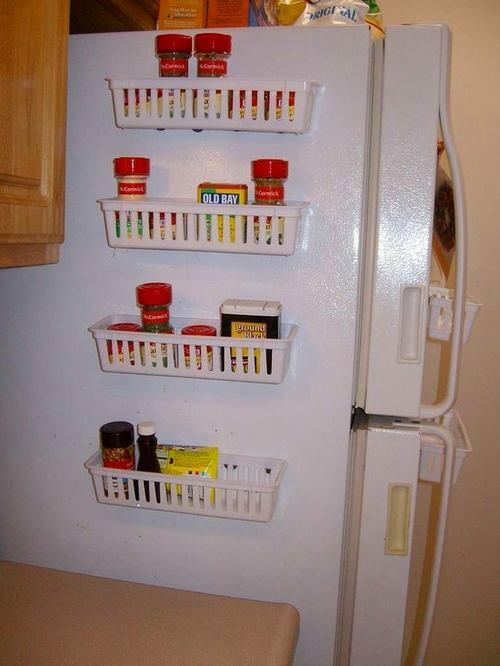 Spice jars are a good alternative to traditional fridge magnets. 8. 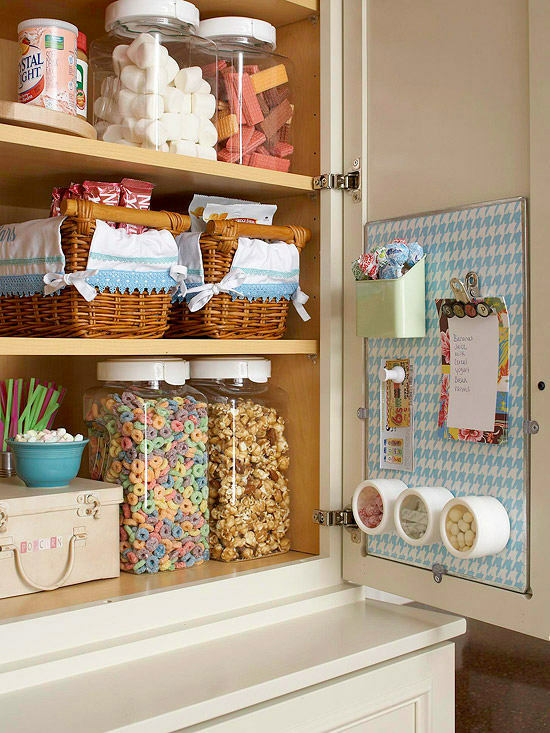 Your budget allowing, always give preference to drawers instead of cabinets: they’re far more convenient and save space. 9. 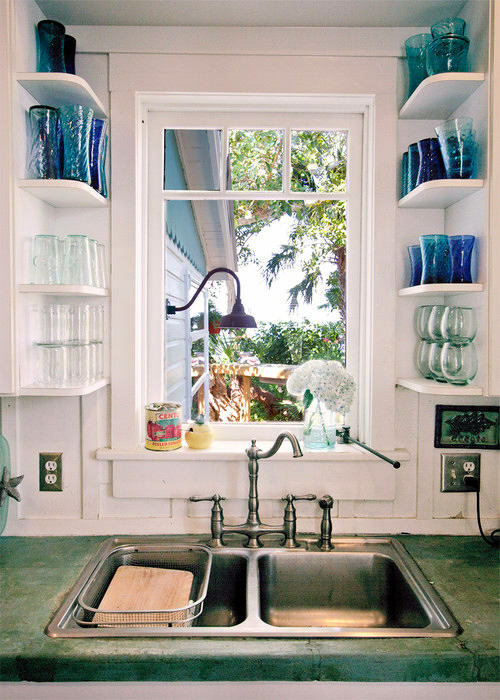 Make most of every inch of your kitchen walls. 10. Do not ignore sides of your cabinets! 11. 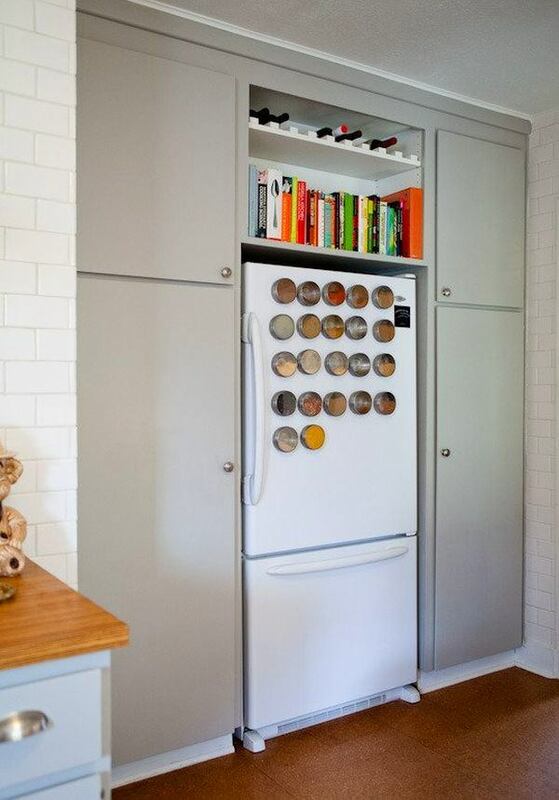 Magnetic boxes are a good way to improve the usefulness of your refrigerator. 12. 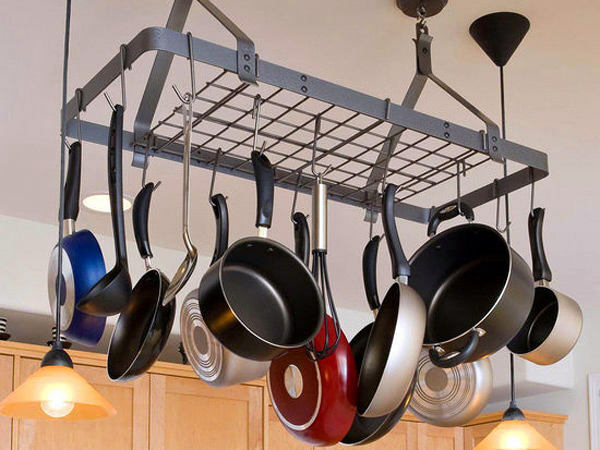 You can also mount pans and pots to the ceiling. 13. Inconvenient corner cabinets can be adapted for pan storage by means of a few hooks. 14. 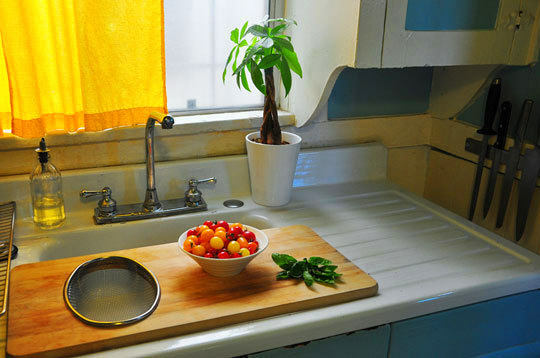 A cutting board placed on a sink can temporarily increase your worktop. 15. Common paper organizers play the role of extra shelves. 16. 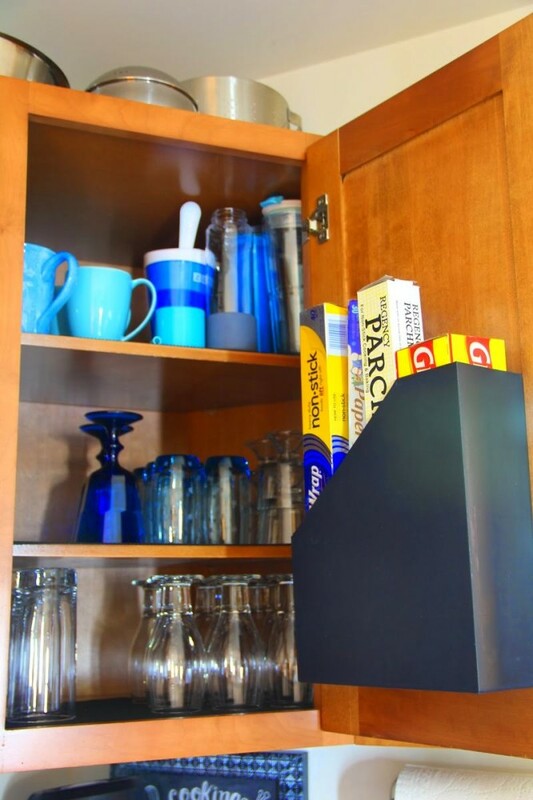 And even if your cabinets are packed from top to bottom, the inside of a cabinet door can be used for keeping pot holders, oven mitts and towels. 17. 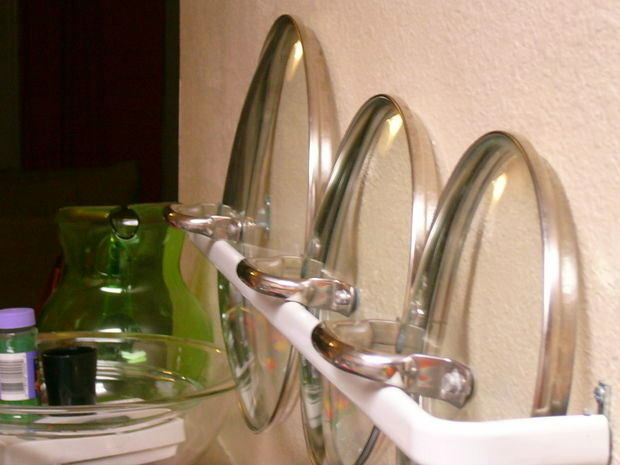 Plastic rails are one of the best options for keeping pot lids. 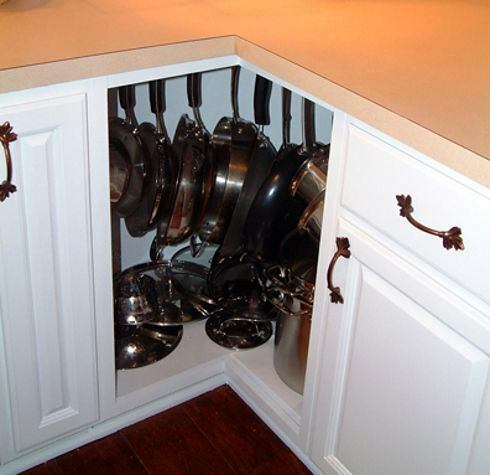 You may find out more ideas about rational storage of pot lids in our previous post. 18. 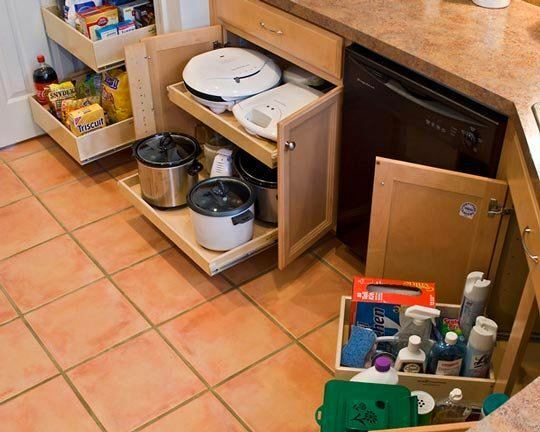 Optimize your cabinets by extra shelving. 19. 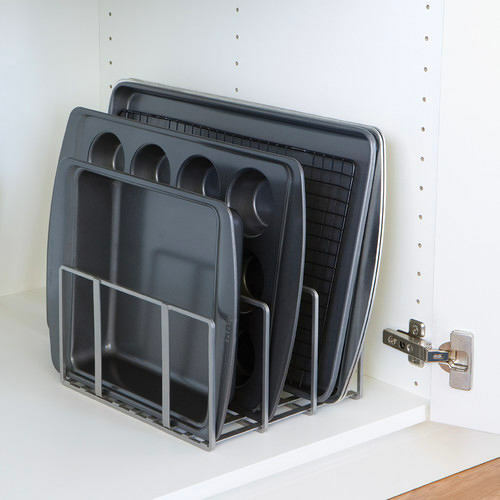 Keep trays, cutting boards and other flat things in paper organizers. 20. 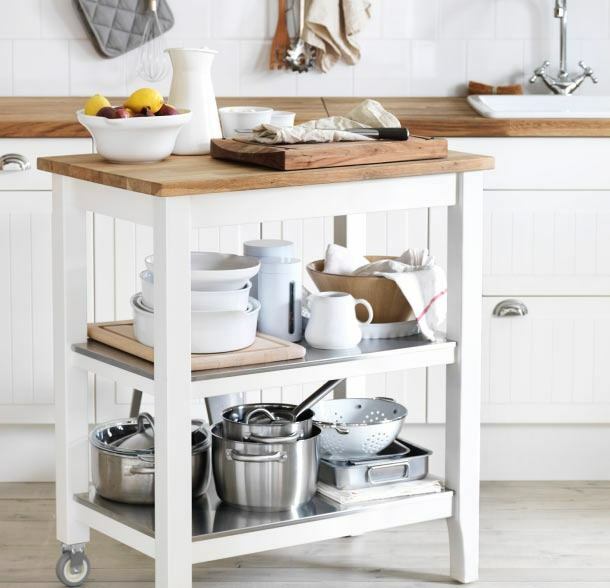 A serving cart is a great multifunctional thing for a tiny kitchen: it’s an extra worktop, a makeshift snack bar and an additional storage area. 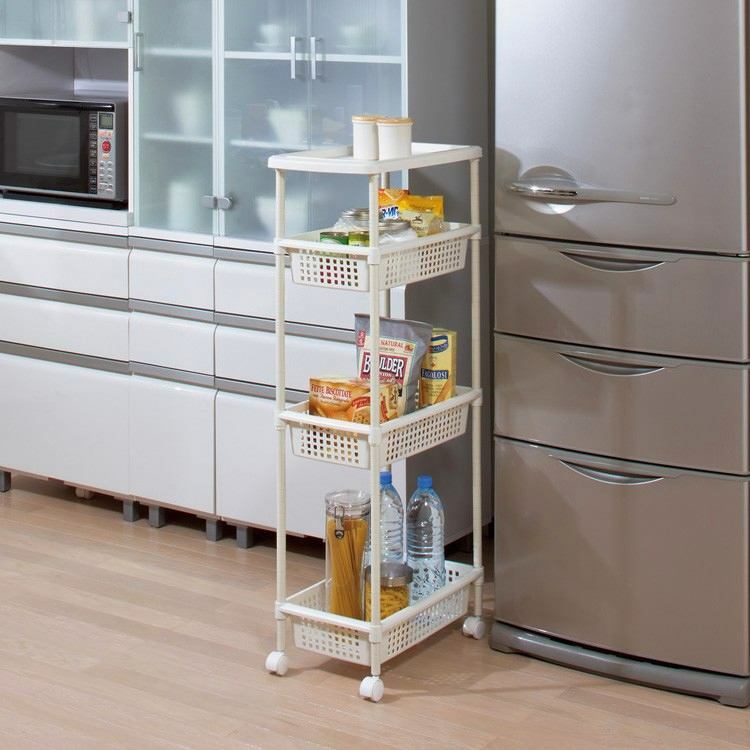 You may find out more ideas about serving trolleys in our previous post. 21. 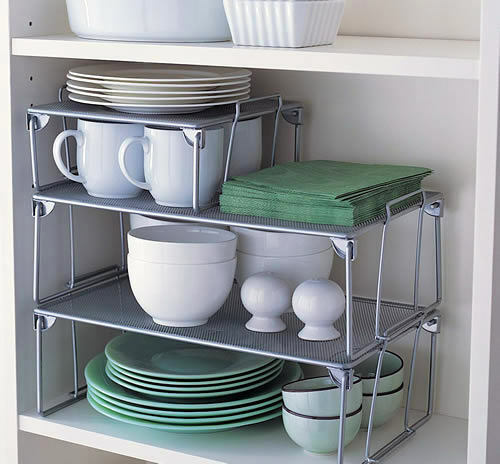 And even an extra narrow serving trolley can make kitchen space more rational. 22. 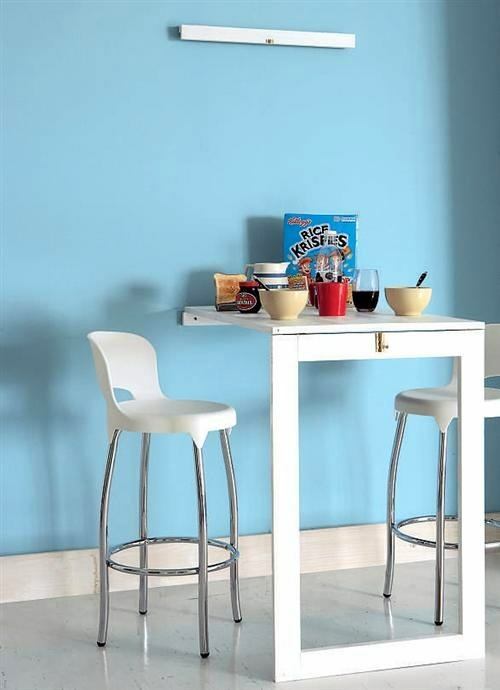 A folding table is what you need in limited areas. 23. Individual approach to furniture design solves many problems. 24. 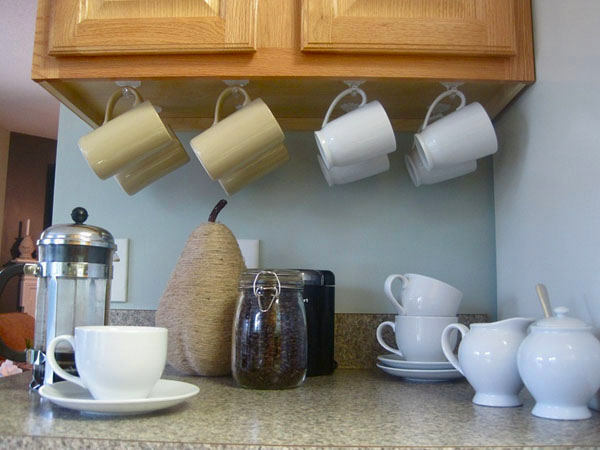 Do not forget about the space above your top cabinets. It’s good for keeping stuff you use once in a blue moon. 25. The bottom of the cabinet can also be used wisely. Dreams Come True: Now Quadcopters Can Guard Houses!